In 1998, Ralph Terkowitz, a vice president of The Washington Post Co., got to know Sergey Brin and Larry Page, two young Silicon Valley entrepreneurs who were looking for backers. Terkowitz remembers paying a visit to the garage where they were working and keeping his car and driver waiting outside while he had a meeting with them about the idea that eventually became Google. An early investment in Google might have transformed the Post's financial condition, which became dire a dozen years later, by which time Google was a multi-billion dollar company. But nothing happened. “We kicked it around,” Terkowitz recalled, but the then-fat Post Co. had other irons in other fires. Such missteps are not surprising. People living through a time of revolutionary change usually fail to grasp what is going on around them. The American news business would get a C minus or worse from any fair-minded professor evaluating its performance in the first phase of the Digital Age. Big, slow-moving organizations steeped in their traditional ways of doing business could not accurately foresee the next stages of a technological whirlwind. Obviously, new technologies are radically altering the ways in which we learn, teach, communicate, and are entertained. It is impossible to know today where these upheavals may lead, but where they take us matters profoundly. How the digital revolution plays out over time will be particularly important for journalism, and therefore to the United States, because journalism is the craft that provides the lifeblood of a free, democratic society. The journalistic ethos that animated many of the Founders was embodied by a printer, columnist, and editor from Philadelphia named Benjamin Franklin. The printing press, which afforded Franklin his livelihood, remained the engine of American democracy for more than two centuries. But then, in the second half of the 20th century, new technologies began to undermine long-established means of sharing information. First television and then the computer and the Internet transformed the way people got their news. Nonetheless, even at the end of the century, the business of providing news and analysis was still a profitable enough undertaking that it could support large organizations of professional reporters and editors in print and broadcast media. Now, however, in the first years of the 21st century, accelerating technological transformation has undermined the business models that kept American news media afloat, raising the possibility that the great institutions on which we have depended for news of the world around us may not survive. These are painful words to write for someone who spent 50 years as a reporter and editor at The Washington Post. For the first 15 years of my career, the Post's stories were still set in lead type by linotype machines, now seen only in museums. We first began writing on computers in the late 1970s, which seemed like an unequivocally good thing until the rise of the Internet in the 1990s. Then, gradually, the ground began to shift beneath us. 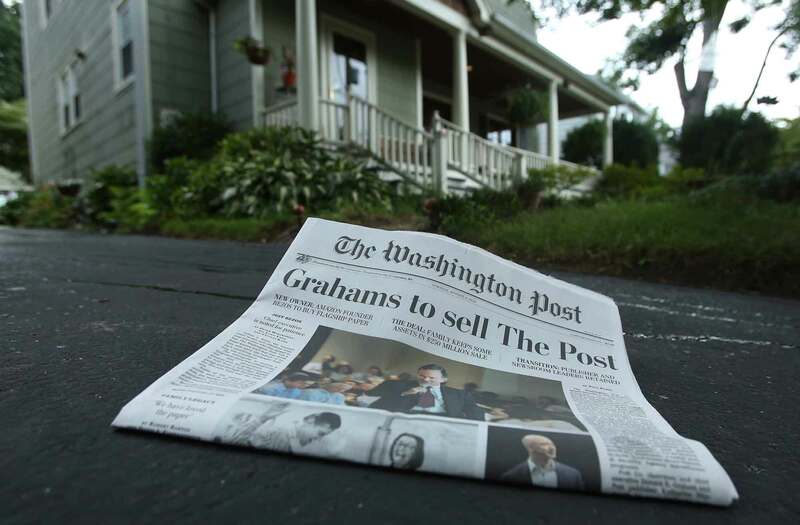 By the time I retired earlier this year, the Graham family had sold the Post to Jeff Bezos, the founder of Amazon, for $250 million, a small fraction of its worth just a few years before. Donald Graham, the chief executive at the time, admitted that he did not know how to save the newspaper. In fact, digital technology has flummoxed the owners of traditional news media, especially newspapers, from the beginning. For example, in 1983, in the early years of computerized production of newspapers when almost no one knew what was coming, The New York Times almost committed digital suicide. The Times decided it only needed to retain the rights to the electronic versions of its stories for 24 hours after publication. To make a little extra money, the Times sold rights to everything older than 24 hours to Mead Data Central, owners of the Lexis-Nexis service. Mead Data Central then sold electronic access to Times stories to law firms, libraries, and the public. By the early 1990s, as the Internet was becoming functional and popular, this arrangement was a big and growing problem: newspapers, including the Times, were planning “online,” computerized editions, but the Times had sold control of its own product to Mead Data. Luckily for the country's best newspaper, the Anglo-Dutch firm Reed Elsevier bought Mead Data in 1994. The sale triggered a provision in the original Times-Mead contract that allowed the Times to reclaim the electronic rights to its own stories. That enabled the Times to put its journalism online in 1995. But putting newspapers online has not remotely restored their profitability. 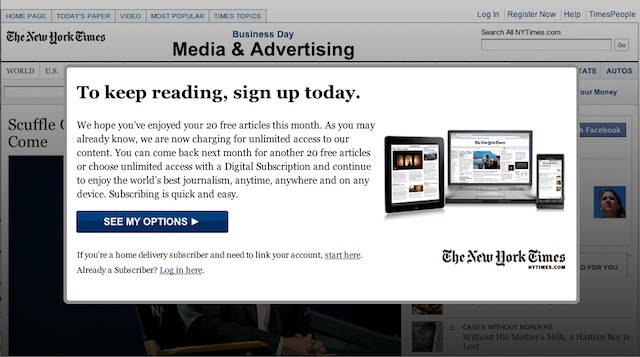 For the moment, The New York Times is making a small profit, but its advertising revenues are not reassuring. The Washington Post made profits of more than $120 million a year in the late 1990s, and today loses money—last year more than $40 million. Newsweek magazine failed, and Time magazine is teetering. Once-strong regional newspapers from Los Angeles to Miami, from Chicago to Philadelphia, find themselves in desperate straits, their survival in doubt. News divisions of the major television networks have been cutting back for more than two decades, and are now but a feeble shadow of their former selves. Overall the economic devastation would be difficult to exaggerate. One statistic conveys its dimensions: the advertising revenue of all America's newspapers fell from $63.5 billion in 2000 to about $23 billion in 2013, and is still falling. Traditional news organizations' financial well-being depended on the willingness of advertisers to pay to reach the mass audiences they attracted. Advertisers were happy to pay because no other advertising medium was as effective. But in the digital era, which has made it relatively simple to target advertising in very specific ways, a big metropolitan or national newspaper has much less appeal. Internet companies like Google and Facebook are able to sort audiences by the most specific criteria, and thus to offer advertisers the possibility of spending their money only on ads they know will reach only people interested in what they are selling. So Google, the master of targeted advertising, can provide a retailer selling sheets and towels an audience existing exclusively of people who have gone online in the last month to shop for sheets and towels. 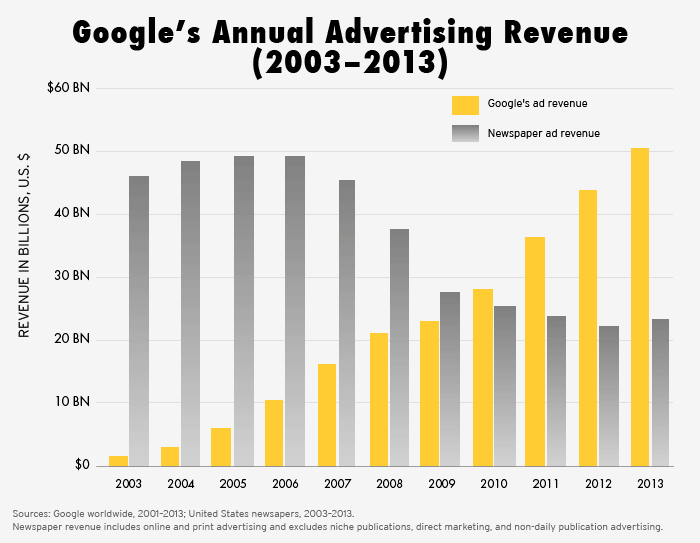 This explains why even as newspaper revenues have plummeted, the ad revenue of Google has leapt upward year after year—from $70 million in 2001 to an astonishing $50.6 billion in 2013. That is more than two times the combined advertising revenue of every newspaper in America last year. And the situation for proprietors of newspapers and magazines is likely to get worse. One alarming set of statistics: Americans spend about 5 percent of the time they devote to media of all kinds to magazines and newspapers. 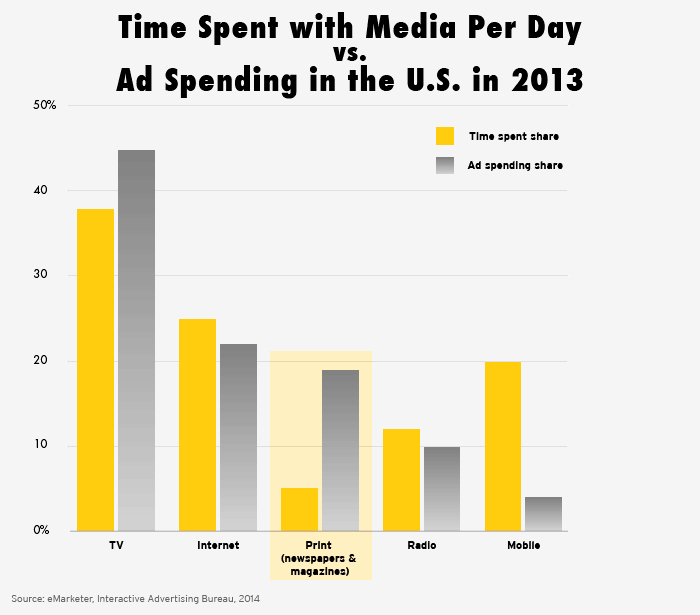 But nearly 20 percent of advertising dollars still go to print media. So print media today are getting billions more than they probably deserve from advertisers who, governed by the inertia so common in human affairs, continue to buy space in publications that are steadily losing audience, especially among the young. When those advertisers wake up, revenues will plummet still further. News organizations have tried to adapt to the new realities. As the Internet became more popular and more important in the first decade of the 21st century, newspaper proprietors dreamed of paying for their newsrooms by mimicking their traditional business model in the online world. Their hope was to create mass followings for their websites that would appeal to advertisers the way their ink-on-paper versions once did. But that’s not what happened. The news organizations with the most popular websites did attract lots of eyeballs, but general advertising on their sites did not produce compelling results for advertisers, so they did not buy as much of it as the papers had hoped. And the price they paid for it steadily declined, because as the Internet grew, the number of sites offering advertising opportunities assured that “supply” outstripped “demand.” Advertising revenues for the major news sites never amounted to even a significant fraction of the revenues generated by printed newspapers in the golden age. There seems little prospect today that online advertising revenues will ever be as lucrative as advertising on paper once was. The other online innovation that has devastated newspapers is Craigslist, the free provider of what the newspapers call “classified advertising,” the small items in small print used by individuals and businesses for generations to buy and sell real estate and merchandise, and to hire workers. Twenty years ago classifieds provided more than a third of the revenue of The Washington Post. Craigslist has destroyed that business for the Post and every major paper in the country. 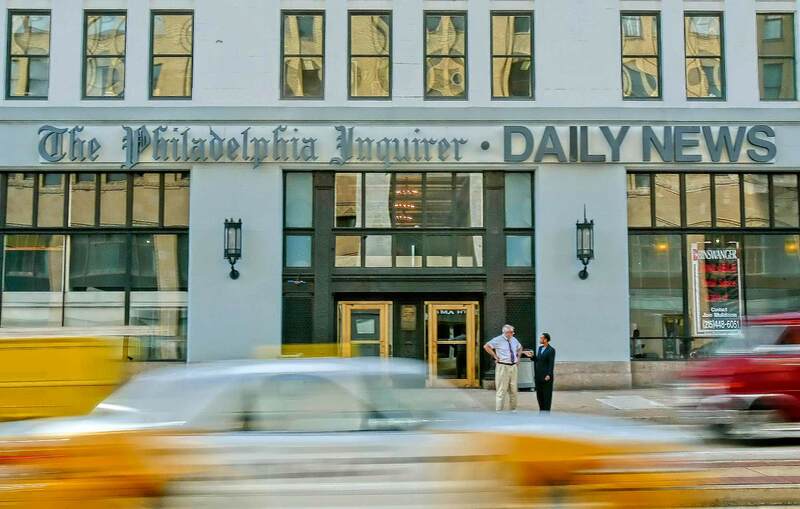 The Philadelphia Inquirer/Daily News headquarters building on Broad Street in Philadelphia, October 6, 2005. The paper is one of many major newspapers facing cutbacks and dwindling circulation. Despite two decades of trying, no one has found a way to make traditional news-gathering sufficiently profitable to assure its future survival. Serious readers of America's most substantial news media may find this description at odds with their daily experience. After all, The New York Times, The Wall Street Journal, and The Washington Post still provide rich offerings of good journalism every morning, and they have been joined by numerous online providers of both opinion and news—even of classic investigative reporting. 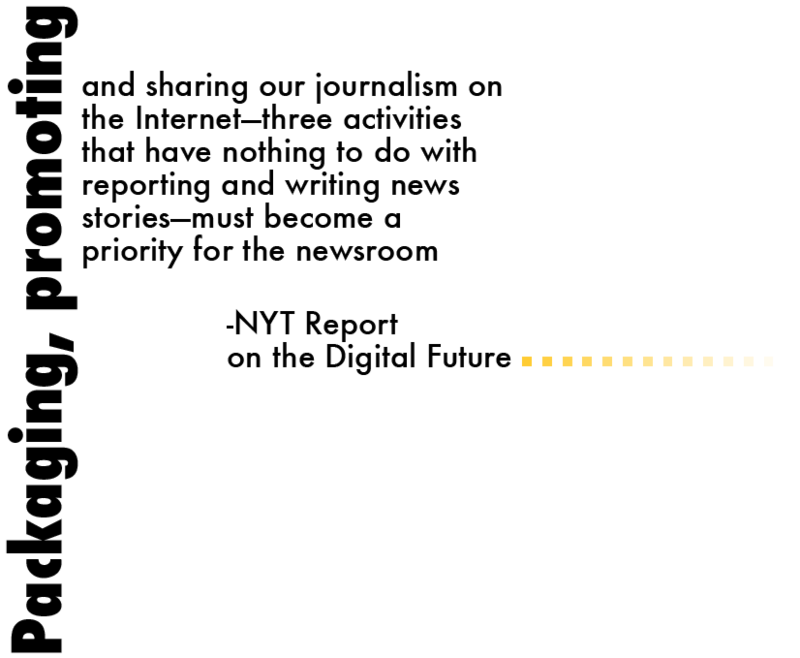 Digital publications employ thousands of reporters and editors in new and sometimes promising journalistic enterprises. Is this a disaster? Of course not—yet. But today's situation is probably misleading. The laws of economics cannot be ignored or repealed. Nor can the actuarial tables. Only about a third of Americans under 35 look at a newspaper even once a week, and the percentage declines every year. A large portion of today's readers of the few remaining good newspapers are much closer to the grave than to high school. Today's young people skitter around the Internet like ice skaters, exercising their short attention spans by looking for fun and, occasionally, seeking out serious information. Audience taste seems to be changing, with the result that among young people particularly there is a declining appetite for the sort of information packages the great newspapers provided, which included national, foreign and local news, business news, cultural news and criticism, editorials and opinion columns, sports and obituaries, lifestyle features, and science news. Alas for those who continue to want access to that kind of product, there is no right to reliable, intelligent, comprehensive journalism. We only get it when someone provides it. And if it doesn’t pay someone a profit, it’s not likely to be produced. New York City. 1959. 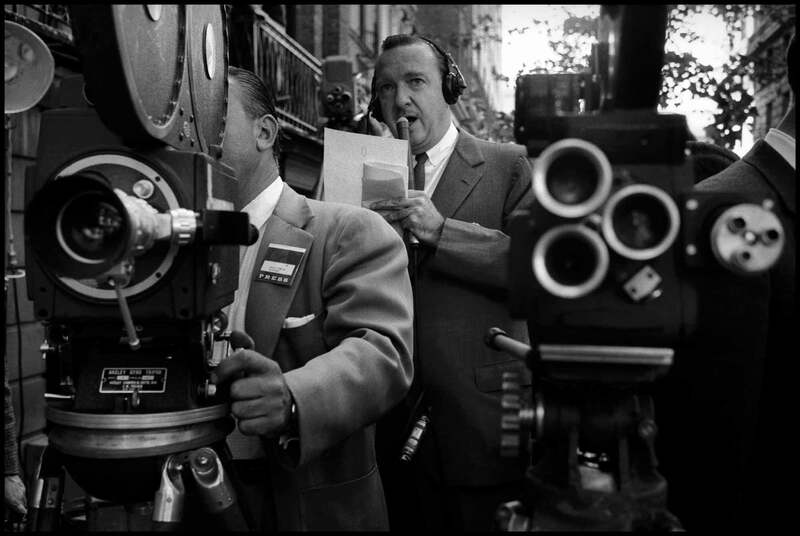 TV news anchorman Walter Cronkite. Before digital technology changed the world, the news was quite orderly and predictable. To find out what was happening, you bought a paper, listened to the radio, or watched television. 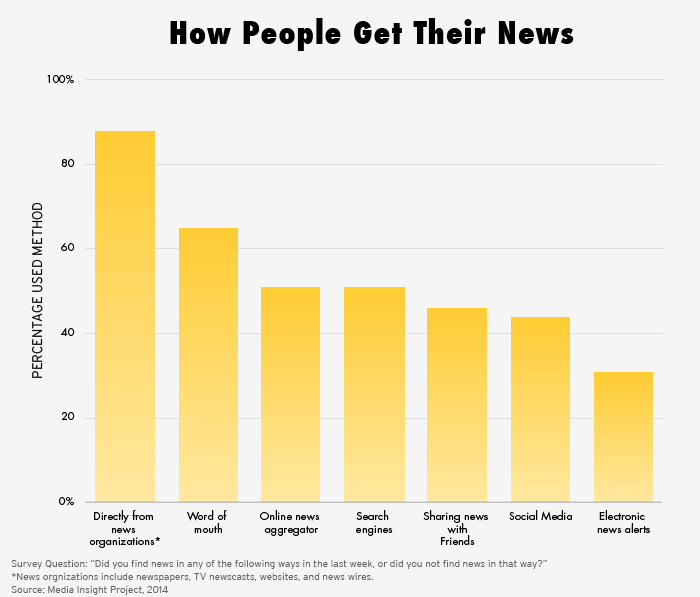 Most people relied on one or two sources for all their news—a newspaper and a TV network, for example. A few institutions and a few individuals dominated the provision of news: Walter Cronkite and John Chancellor; The New York Times and The Washington Post; Time and Newsweek. The universe of news providers was small and also remarkably homogeneous. David Brinkley could move from NBC to ABC without causing much of a stir. When Roone Arledge, whose first big accomplishment was to make ABC the leading network for sports, was empowered to build a new ABC News, he did it by raiding the staffs of NBC and CBS. Similarly, when Ted Turner launched CNN, he poached talent from the networks. This small, nearly-closed world rarely provided any surprises. Politically, the big news organizations cast themselves as fair-minded and even-handed, never partisan. Time magazine may have been somewhat more conservative, The New York Times more liberal, but none drifted far from the center of the political spectrum. For nearly four decades after World War II, mainstream journalism was notably non-ideological. At the height of their success, all the best news organizations shared two important qualities: a strong sense of responsibility about their roles as providers of news and analysis, and plenty of money to spend on those missions. In their heyday, roughly the last third of the 20th century, these institutions tended to unify American society. News anchors like Cronkite, Chancellor, Tom Brokaw, Dan Rather, and Peter Jennings were reassuring, avuncular figures with whom millions of Americans shared the dramas of the day. All the mainstream print and broadcast media sought to provide an information supermarket whose aisles—from sports to business to politics, foreign affairs, entertainment news, and gossip—would hopefully attract mass audiences across all classes of society. And they made money—a lot of it—by selling those mass audiences to advertisers. 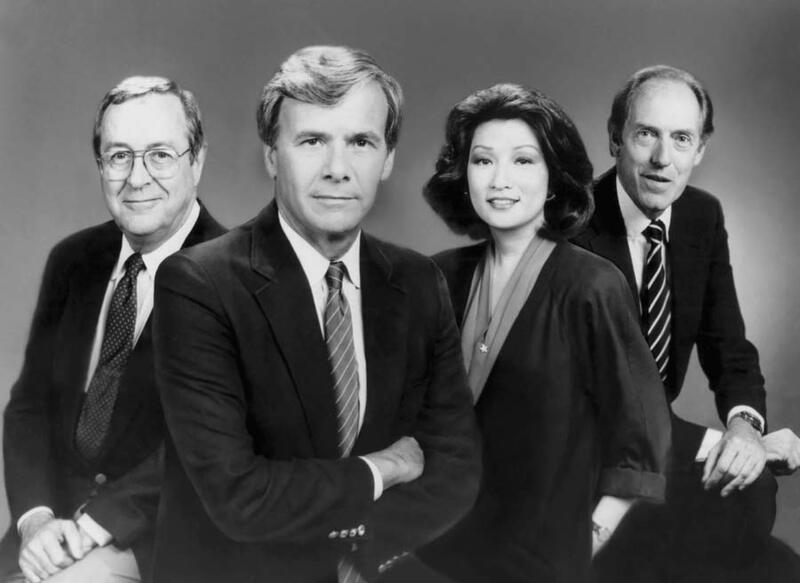 NBC NIGHTLY NEWS -- Pictured: (l-r) John Chancellor, Tom Brokaw, Connie Chung, Garrick Utley. The money allowed for an extravagant approach to news. Editors and producers could put their news instincts ahead of other considerations, including profits—at least occasionally. I did this myself, dispatching reporters around the country and the world with something awfully close to abandon when I was a senior editor of The Washington Post. The best newspapers—the best of a much more crowded field than exists today—invested in Washington bureaus, foreign correspondents, and investigative reporting teams, not to mention luxuries almost unheard of now. For years, for example, no reporter for the Los Angeles Times had to suffer the indignity of flying in coach; business or first class was the norm. The broadcast media enjoyed even more extravagance. In the 1970s the three television networks each maintained large corps of foreign correspondents stationed in bureaus across the globe, and also domestic bureaus in the major American cities. They all did serious documentaries and showed them in prime time. Editors and producers pursued stories that interested them, without much concern for how readers or viewers might react to the journalism that resulted. Members of this tribe of journalists shared a sense of what “the news” was. The most influential of them were the editors and reporters on the best newspapers, whose decisions were systematically embraced and echoed by other editors and writers, as well as by the producers of television news. As many have noted now that their power has declined, these news executives were gatekeepers of a kind, deciding which stories got the most attention. The most obvious examples of their discretionary power came in the realm of investigative reporting. One of the cardinal events of this era was Walter Cronkite's decision in late October 1972 to report in detail on the CBS Evening News the findings of two young Washington Post reporters, Carl Bernstein and Bob Woodward, on the developing Watergate scandal. Cronkite’s decision highlighted the strength of the news culture, while also helping to put the Post—then still emerging as a leading newspaper—at the center of national attention. 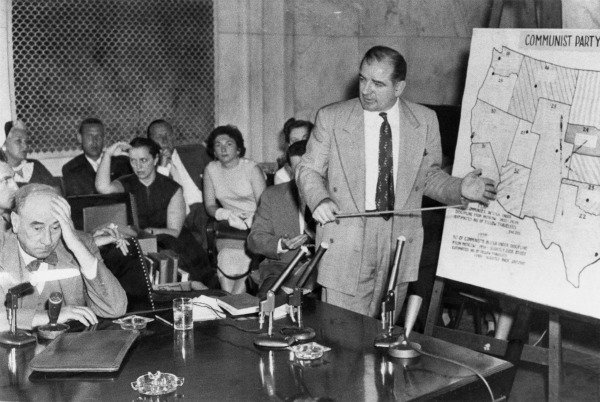 Joseph N. Welch (left) being questioned by Senator Joseph McCarthy (right), June 9, 1954. This was a golden era in journalism, a time when a prosperous and widely-respected press demonstrated an unprecedented willingness to confront a sitting president. Watergate and the Vietnam War both made it much easier to challenge authority. Newspapers especially began to show increasing self-confidence—sometimes it felt like arrogance—by moving away from reactive journalism that focused on the events of the previous day and devoting more space and energy to “enterprise” journalism, which included not just in-depth investigations, but stories about trends in society, profiles, and feature stories. Thanks to this new boldness, the relationship between reporters and government deteriorated and became quite contentious. Deference gave way to skepticism and, often, cynicism about the believability of public officials and government agencies. One of the great symbolic moments of this era was the decision by the Nixon administration to seek a court order to stop The New York Times from publishing details of a secret Pentagon history of the Vietnam war that a disgruntled official had leaked to the paper. Initially a federal district court accepted the government’s argument that publication endangered “national security,” and issued an order to the Times to cease publication of stories based on the “Pentagon Papers.” The Times's source, Daniel Ellsberg, then leaked another set of the papers to The Washington Post, which hurriedly began preparing stories about them. The government sought court action to block the Post as well. The Supreme Court agreed to take the case. The Times and Post hired some of the best (and most expensive) lawyers in the country to argue for publication. The court quickly decided in favor of the newspapers' right to publish. Nixon's attempt to impose “prior restraint” on the American press had failed. Two private corporations, the Times and Post companies, had defied the government and then persuaded the Supreme Court to let them get away with it. Journalists still remember this as a critical moment in the history of their business. Since the late 19th century, American journalists have used their craft to call government and corporations to account for wrongdoing, secret practices, and even corruption, often sparking public outcry and reform. Listed here are ten noteworthy moments in U.S. investigative journalism. It is neither a top ten list nor a ranking of any sort; many well-qualified media outlets have assembled their own excellent lists. 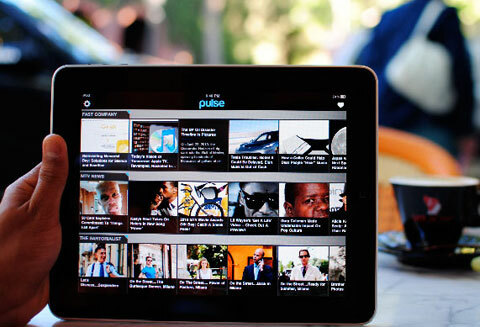 It also focuses on print journalism, though many great episodes of the form have appeared on television. As well, this investigative journalism is but one facet of the vital profession that reports the news. The progressive era of the late 19th and early 20th centuries was a time of social activism as Americans and their president, Theodore Roosevelt, fought corruption and monopolistic practices in government and industry. 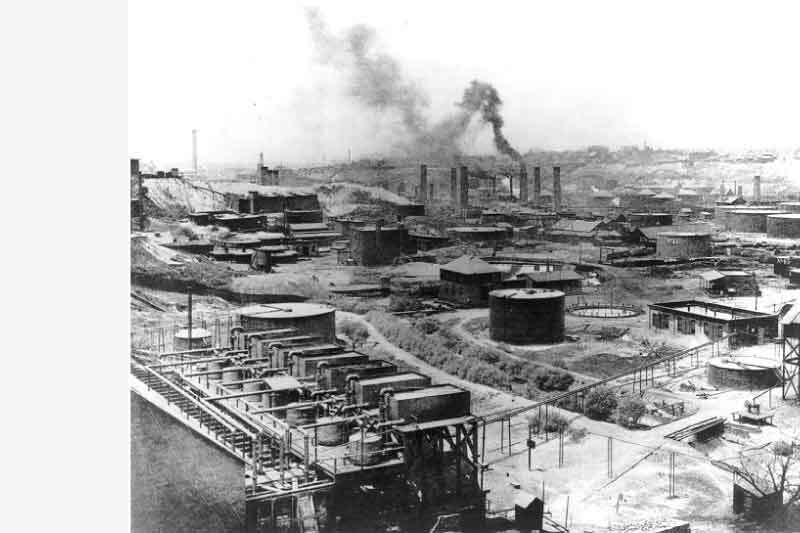 Tarbell, a former school teacher, wrote a series of articles for McClure’s Magazine about the giant Standard Oil Company and its owner John D. Rockefeller. The series was published in book form in 1904, and in 1911 the U.S. Supreme Court found the company to be in violation of the Sherman Antitrust Act, causing its breakup. Ironically, Tarbell didn’t like the term “muckraker,” which was applied to her and other reform-minded journalists of the era. Chicago was America’s center of meat processing and packing around the turn of the century in 1900. Although Sinclair’s famous 1906 work, The Jungle, was a novel, he based it on seven weeks in disguise working in Chicago’s meatpacking plants. His exposé of conditions that immigrant workers faced in the stockyards and the unsanitary practices of the industry coincided with passage of the Pure Food and Drug Act of 1906 and the Federal Meat Inspection Act of 1906. Sinclair later focused on American journalism itself, calling attention in 1920 to the practice of “yellow journalism” in his book The Brass Check. 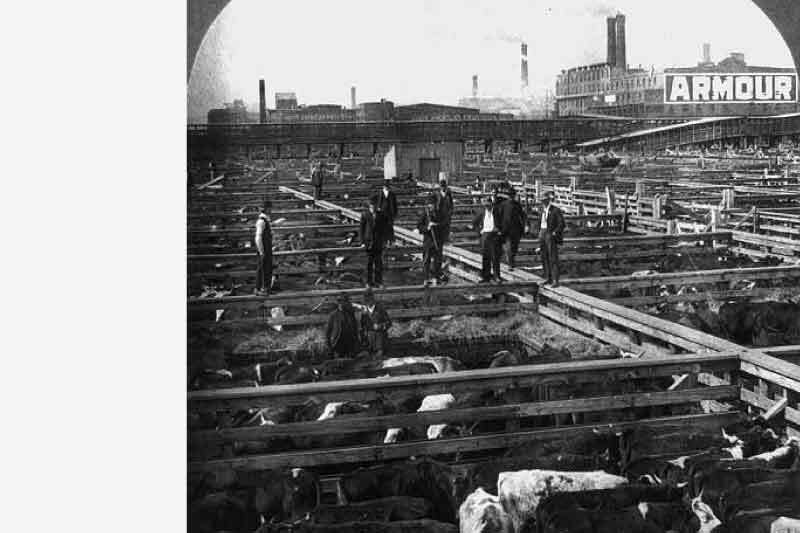 Chicago's Union stockyards cattle pens c. 1909. In February 1950, U.S. Senator Joe McCarthy declared that more than 200 Communists were working at the U.S. State Department. After his re-election in 1952, McCarthy conducted a series of hearings on the matter and implicated Army personnel in espionage. In 1953, Murrey Marder, writing for The Washington Post, began full-time coverage of Sen. McCarthy and his hearings. Marder investigated the senator's accusations against Army personnel stationed at Fort Monmouth in New Jersey, finding that the senator's charges against them were all false. Marder later opened the London bureau of the The Post, and after his retirement, helped create the Nieman Watchdog Project. 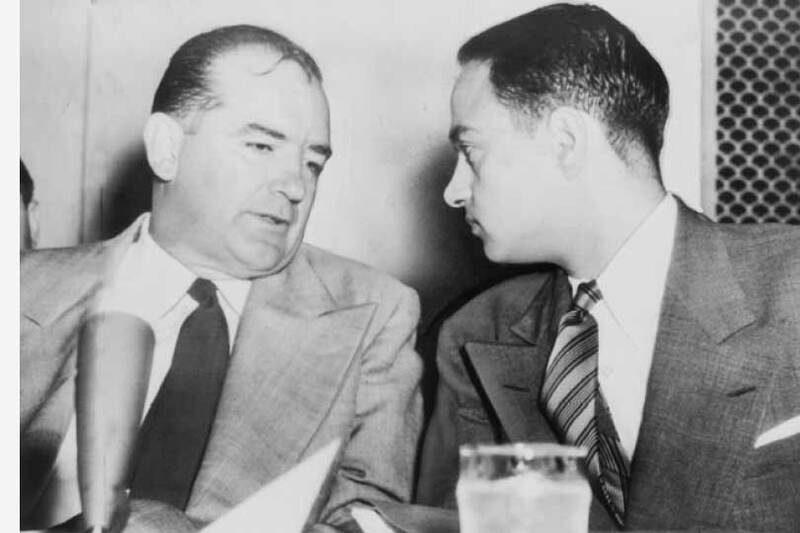 Sen. Joseph McCarthy chats with his attorney Roy Cohn during Senate Subcommittee hearings on the McCarthy-Army dispute. In October 1963, President John F. Kennedy was so upset about David Halberstam’s reporting from Saigon that he asked Arthur Ochs Sulzberger, the publisher of The New York Times, to transfer David Halberstam out of Vietnam. Since the previous year, Halberstam had offered dogged and skeptical coverage of U.S. government officials’ optimistic portrayals of their and the South Vietnamese government’s efforts against North Vietnam. “The job of the reporters in Vietnam,” Halberstam wrote in 1965, “was to report the news, whether or not the news was good for America.” In 1964, Halberstam earned a Pulitzer Prize for his Vietnam reporting. 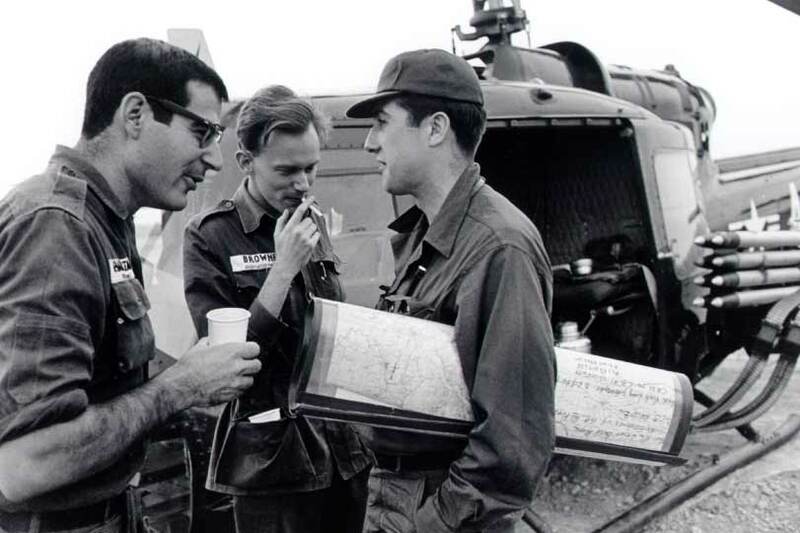 Reporters David Halberstam of the New York Times, AP Saigon correspondent Malcolm Brown and Neil Sheehan of UPI, chat beside a helicopter in Vietnam. In March 1968, U.S. Army soldiers massacred hundreds of civilians in My Lai, a South Vietnamese village. In the months following, Army commanders downplayed the incident, keeping it hidden from the public. However, due to pressure on the chain-of-command from a soldier in the infantry company involved, Lieutenant William Calley, Jr. was court martialed in September 1969 for his role. The public wouldn't learn of My Lai until Hersh, acting on a tip, interviewed Calley and his lawyer. Hersh's story was published by Dispatch, a small news agency with a tiny staff, and then picked up nationally. Calley was the only soldier convicted in relation to the massacre. Hersh won the 1970 Pulitzer Prize for his reporting. 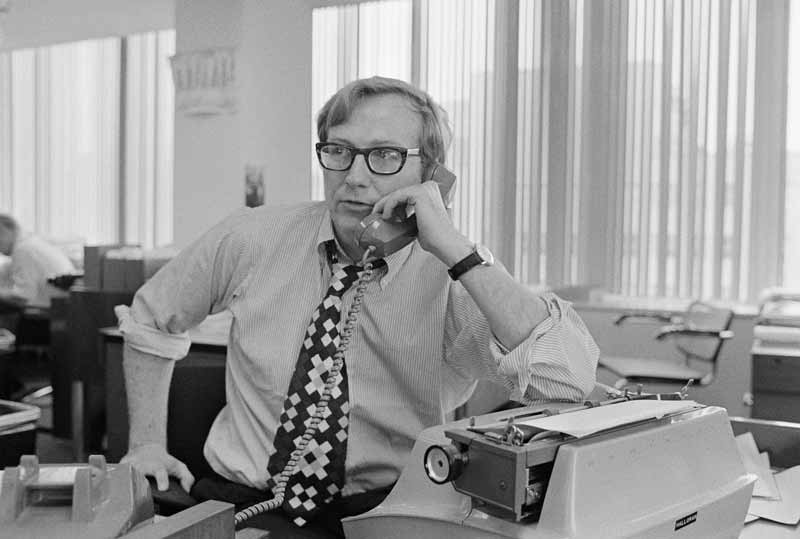 New York Times reporter Seymour Hersh talks on the telephone at his New York Times Washington Bureau office June 14, 1972. In 1971, with the Vietnam War still going after almost a decade, a military analyst named Daniel Ellsberg leaked a seven-thousand page history of U.S.-Vietnam relations that had been prepared for internal use by the Pentagon. 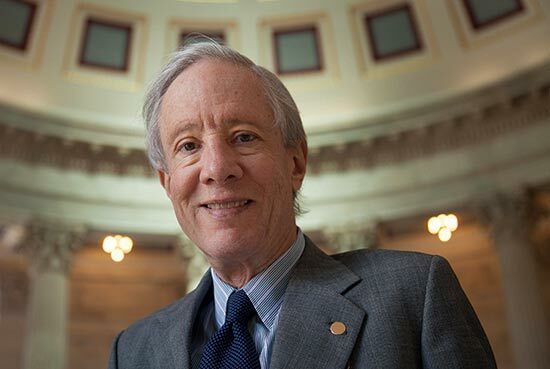 Lengthy sections of these “Pentagon Papers” were published in The Washington Post and The New York Times, revealing the covert origins of a war that was exceedingly unpopular at home. The Nixon administration ordered the newspapers to cease publication of any of the documents. 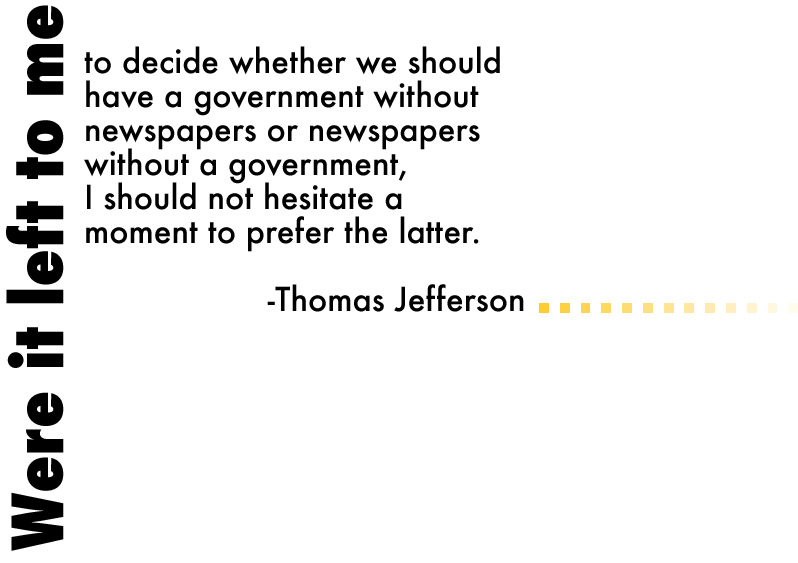 This led to a Supreme Court case (New York Times Co. v. United States) that eventually ruled in favor of the press. 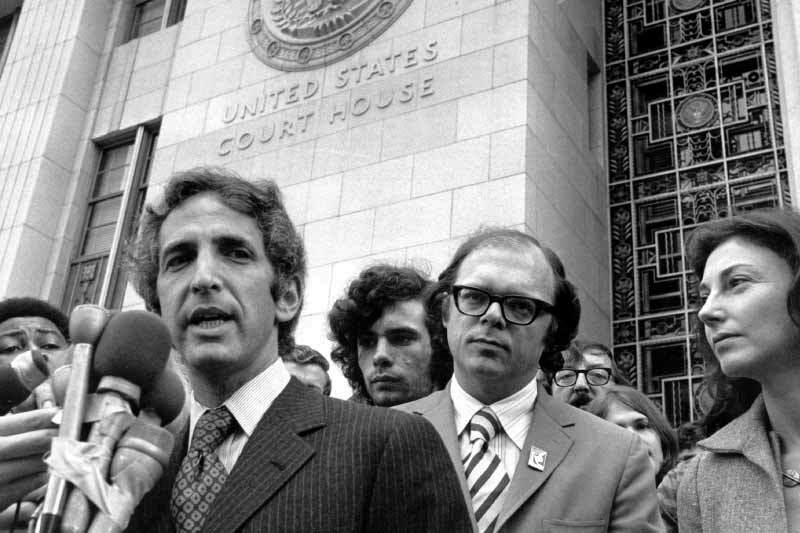 Daniel Ellsberg (l) talks to reporters outside the Federal Building in Los Angeles, Ca. on Jan. 17 1973. His co-defendant, Anthony Russo is on the right. In June 1972, five men were arrested for breaking into the Democratic National Committee offices at the Watergate Complex in Washington, DC. Two young reporters at The Washington Post, Bob Woodward and Carl Bernstein, were intrigued that one of the burglars was on the payroll of President Richard Nixon’s reelection committee and began digging further. Woodward and Bernstein uncovered a series of political crimes and “dirty tricks” that connected the burglary back to the White House. Their reporting led to indictments of 40 administration officials and the eventual resignation of President Nixon. The paper won the 1973 Pulitzer Prize for the investigative reporting. 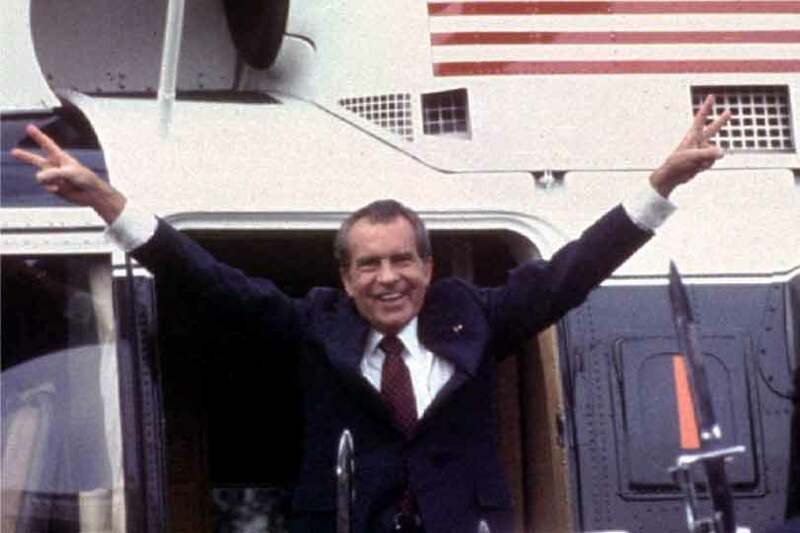 Richard Nixon departs from the White House , August 9 1974 after resigning the presidency. In 1992, shortly after the Anita Hill controversy, Florence Graves, founder of Common Cause magazine, began an investigation into sexual misconduct on Capitol Hill. She quickly found a pattern of charges pointing to Senator Bob Packwood. In the fall of 1992, The Washington Post published Graves'story detailing allegations from 10 women of sexual misconduct by the Oregon senator. The story not only led to the first-ever Senate Ethics Committee investigation of sexual misconduct and the eventual resignation of Senator Packwood, but also to the passage of the landmark Congressional Accountability Act, subjecting Congress to the same discrimination laws as the rest of the nation. Sen. Bob Packwood leaves his Senate office after he announced his resignation September 7, 1995. The Senate Ethics Committee had recommended Packwood's expulsion on sexual and official misconduct charges. On July 19, 2010, Washington Post reporters Dana Priest and William Arkin published “Top Secret America,” a series of investigative articles revealing the massive and what they characterized as mismanaged post-9/11 growth of the U.S. intelligence community. The series, benefiting from the work of more than a dozen other journalists at The Post, compiled hundreds of thousands of records over two years, identifying 45 government organizations (1,271 sub-units) and 1,931 private companies engaged in top-secret intelligence work. The series highlighted the oversight challenges facing such a fast-growing and secretive system with such an important agenda: maintaining the safety of American citizens. 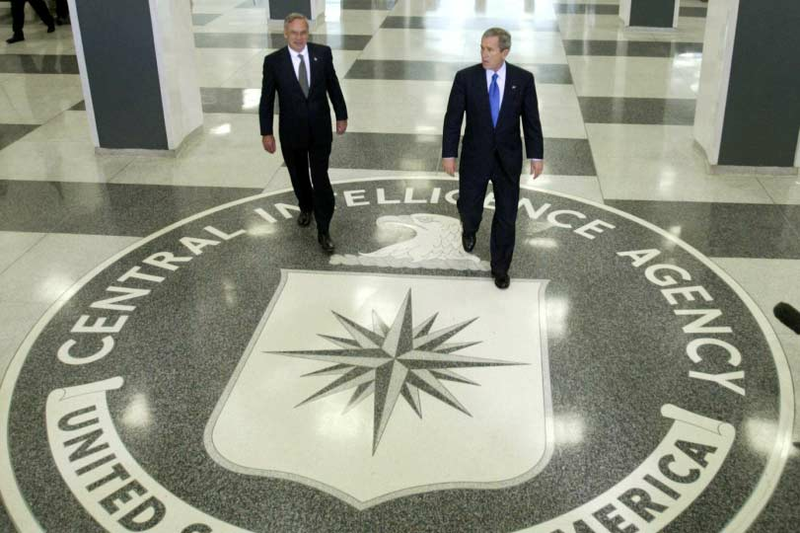 U.S. President George W. Bush (r) and Porter Goss, director of the Central Intelligence Agency (CIA), walk to make remarks in the lobby of the CIA headquarters in Langley, Virginia. 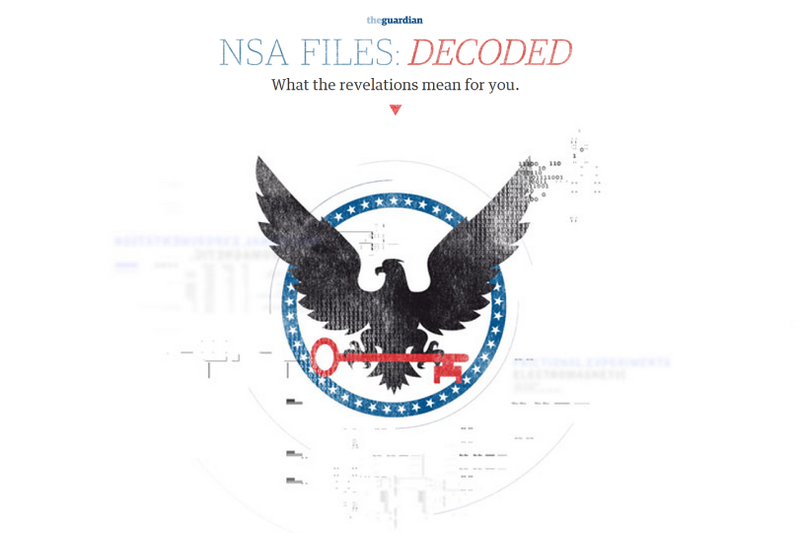 In early June 2013, The Post and The Guardian broke nearly-simultaneous stories about National Security Agency surveillance activities being conducted on U.S. citizens and foreign officials. Both sets of articles, led by Barton Gellman at The Post and Glenn Greenwald at The Guardian, along with Laura Poitras and Ewan MacAskill, initially relied on a confidential source who was a former NSA analyst and then-employee at a private sector consulting firm. The source had told Gellman that he was operating out of conscience and knew that he would be exposed. That person was Edward Snowden. Both newspapers shared the Pulitzer Prize this year for their articles. 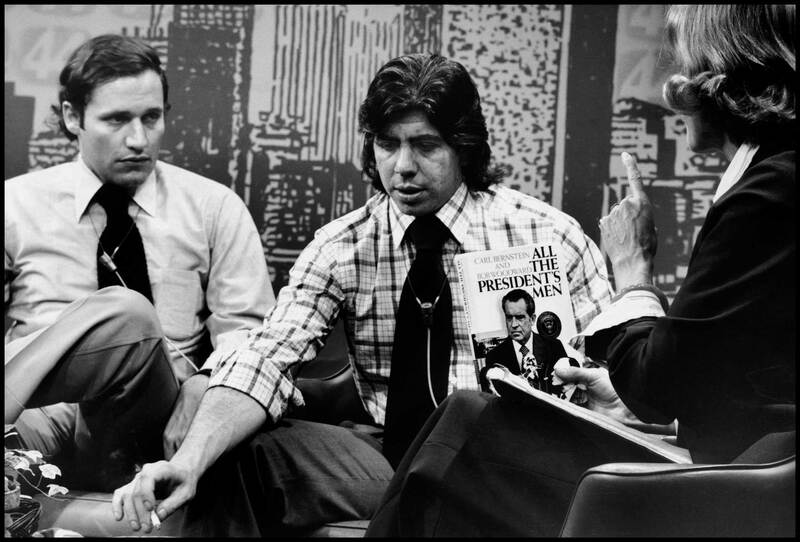 Washington Post reporters Carl Bernstein (center) and Bob Woodward (left), the team who broke the Watergate story. Washington, D.C., 1974. The golden era had its shortcomings, to be sure. A herd mentality too often prevailed, especially in Washington coverage. Self-important journalists were too common. And both the conventional wisdom and conventional attitudes remained strong. So, for example, when confronted by a story like the AIDS epidemic, the great news organizations reacted slowly and clumsily. Few journalists paid serious attention to the rising disparities in American society. Toward the end of the era, in the first years of the 21st century, the news media succumbed to the national anxieties produced by the 9/11 attacks and failed to challenge effectively the Bush administration's rush to war in Iraq. Many journalists joined the rush. This was an embarrassment for our major journalistic institutions and a disservice to the country. Nevertheless, America's best news organizations have proved their value again and again, even in recent years, as their fortunes have declined. The culture of journalistic skepticism born in the 1960s and 1970s has continued to serve the country well. Repeatedly, journalists have broken significant news stories that government officials hoped would never be revealed, from accounts of Americans torturing terror suspects to revelations of the systematic mistreatment of veterans at Walter Reed Hospital; from accounts of the government's eavesdropping programs to descriptions of its vast, post-9/11 intelligence apparatus. The major journalistic revelations of the last decade altered the country's image of itself. They mattered. And society has benefited in less tangible ways, too. “How would this look on the front page of The Washington Post?” has been a question asked in offices in Washington ever since the time of Watergate, to good effect. Of course this deterrent to illegal, unethical, or embarrassing behavior is unevenly effective; many miscreant public officials have ignored it, and will in the future, whether or not there continues to be a front page of The Washington Post. But this sense of accountability has had a salutary effect. 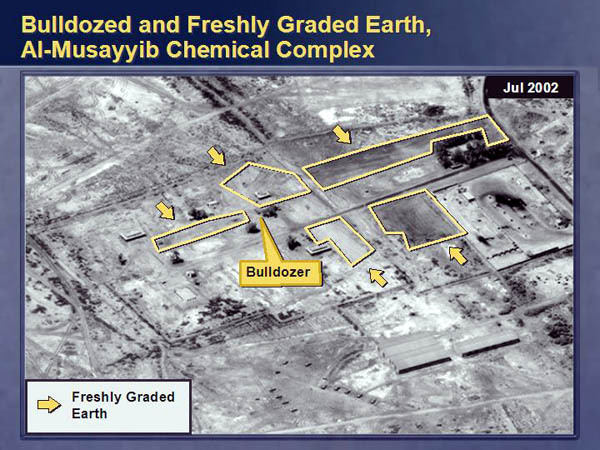 A slide from Secretary of State Colin Powell's presentation to the UN asserting WMD manufacturing capabilites in Iraq and a link between Saddam Hussein and alQaeda. The best journalism has most often been produced by those news organizations that have both the resources and the courage to defend their best work when it offends or alarms powerful institutions and individuals. The public may perceive journalism as an individualistic enterprise carried out by lone rangers of rectitude, but this is rarely the case. The best work is usually done by a team that has the backing of an organization committed to maintaining the highest standards of seriousness and integrity, and to nurturing talented reporters and editors. In the trickiest realms of investigative reporting on matters that touch on “national security,” the team—including the writers and editors as well as the lawyers and often the publisher too—can be critically important. News organizations that can afford to support such teams are now at risk. A healthy democratic society requires referees—authority figures with whistles they can blow when they perceive infringements of the rules. Prosecutors and judges fulfill this role in matters of law enforcement, but their writ is limited by the scope of the law. “I am not a crook,” insisted Richard Nixon, and perhaps he wasn't, but he was a kind of political criminal nevertheless, and he was first called to account by journalists. Will such whistle blowers be on the job to confront the next Nixon? 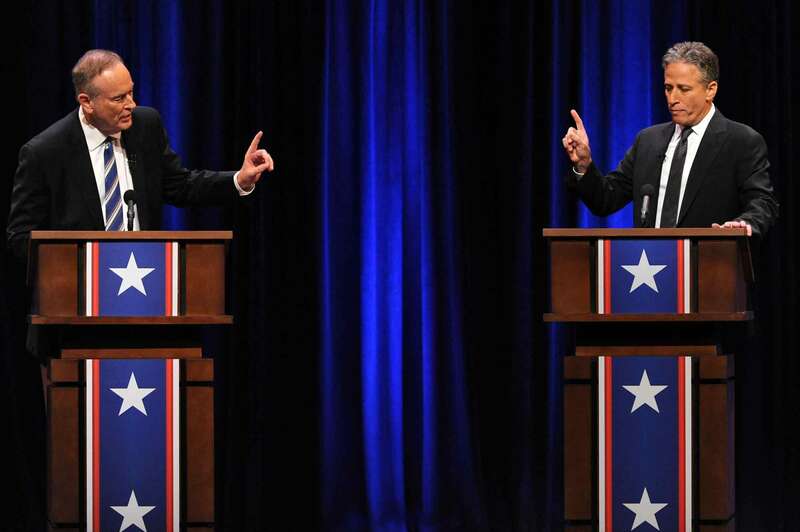 Bill O'Reilly vs. Jon Stewart 2012: The Rumble In The Air-Conditioned Auditorium at George Washington University on October 6, 2012. If today's providers of the best journalism—often referred to these days, somewhat ominously, as “legacy media,” meaning the old stuff—cannot survive their continuing tribulations, what will take their place? Predicting the future is a fool's errand, but some trends are clear. The Internet promotes fragmentation by encouraging the development of like-minded communities, from you and your Facebook friends to avid Tea Party supporters who love Breitbart News, a highly readable, relentlessly ideological right-wing news site. Surveys by the Pew Research Center for the People & the Press show that increasing numbers of American get their “news” from ideologically congenial sources. The news media are fragmenting just as American society is fragmenting—by class, by region, by religious inclination, by generation, by ethnic identity, by politics and more. The rise of the fragmented news media is quite a recent phenomenon. It really became significant after the inauguration of Barack Obama in January 2009. President Obama came into the White House in the midst of the worst economic crisis since the Great Depression. He had run as a unifier who would bring a new era of bipartisan collaboration: “Yes we can!” But no, he couldn't. Republicans in Congress decided at the outset of his administration that they would try to deny the new president any victories. Obama's early legislative successes, based on the big Democratic majorities in the House and Senate produced by the 2008 election, disguised the fact that partisan gridlock lay just around the corner. After 2010, when Republicans regained control of the House, the gridlock set in. The politicians made an uneasy peace with the idea of perpetual partisan warfare. Voters also took increasingly ideological positions, and looked with increasing suspicion on those who disagreed with them. Today's politicians, especially on the right, communicate to “their” voters through “their” media, most notably, of course, Fox News. Similarly, liberal Democrats like to appear on MSNBC. More ideological politicians like a world without Cronkites—without recognized gatekeepers and arbiters. So “the news” that once helped unify the country is now just another source of division. Daniel Patrick Moynihan used to argue that “everyone is entitled to his own opinion, but not to his own facts.” No longer. Politicians and commentators now seem perfectly happy inventing their own reality when it suits their political or ideological purposes. Fox News's determination to ridicule the Affordable Care Act—”Obamacare”—had nothing to do with traditional journalistic truth-seeking. Rather, it was part of a propaganda campaign. The MSNBC cable network, part of NBC, which used to be a serious news organization, saw a business opportunity in making itself a liberal alternative to Fox, the most profitable cable news network, and now unabashedly propagates a liberal view of the news. Fox and MSNBC have both decided to cater to their audiences not with original reporting of the news (which is expensive), but with commentary on the news interspersed with broadcasts of set-piece events like presidential news conferences. Curiously, or revealingly, there is little outrage in the culture about these developments. We seem to have adapted to the demise of the old expectations about accuracy, fairness, and reporting without much of a fight. Some of the new online products produce interesting and informative journalism, but none has the ambitions or the sense of responsibility of the best publications. They couldn't afford those luxuries. A great news organization is expensive. 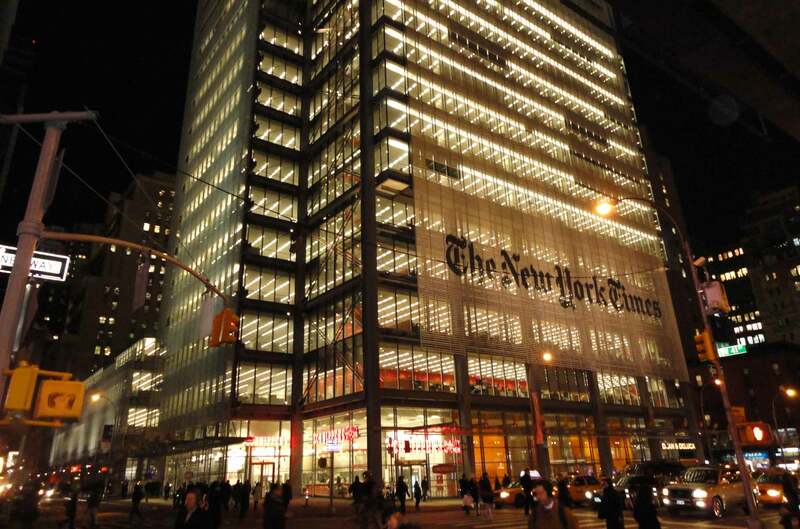 The newsroom of The New York Times costs about $230 million a year. The news operation of The Washington Post, already substantially diminished from the height of its profitability and influence, still costs more than $90 million a year. Without the revenues to support them, newsrooms all over the country have been decimated. 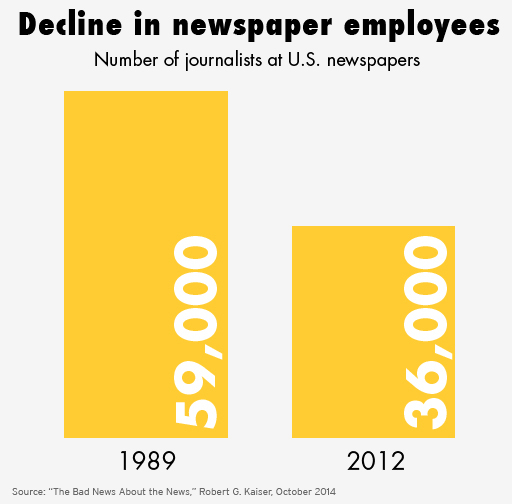 Newspapers employed 59,000 journalists in 1989, and 36,000 in 2012 (and fewer since then). Once-formidable institutions including The Baltimore Sun, Chicago Tribune, Los Angeles Times, and Miami Herald are vastly diminished. Others have gone out of business altogether. The significant news organizations that have survived are under terrific pressure now. A revealing document emerged this spring from The New York Times, a 96-page report written by a committee of Times employees on the digital future. Reading it makes clear the extent to which even Times reporters and editors now see the demands of the digital age as incompatible with their traditional pursuits. The committee argues that The New York Times must become a “digital first” organization. “That means aggressively questioning many of our print-based traditions and their demands on our time, and determining which can be abandoned to free up resources for digital work.” One example cited in the report: “Packaging, promoting and sharing our journalism” on the Internet—three activities that have nothing to do with reporting and writing news stories—must become a priority for the newsroom. Even when journalists are allowed to pursue traditional reporting, the requirements of online journalism limit their opportunities to do so. Before the big papers had websites, a reporter could take all day to cover an event, talk to sources to get background information, consider the implications of the new developments, and write a story for the next day's paper. Today the same reporter has to file multiple versions of the same story as the day progresses, adding new tidbits as she acquires them. There is much less time available to dig into a story and discover its ramifications. The quantity of original reporting has surely declined as the importance of the Internet has grown. One immediate effect of all these changes and cutbacks is that there's no paper in America today that can offer the same coverage of its city, suburbs, and state that it provided 20 or even 10 years ago, and scores of city halls and state legislatures get virtually no coverage by any substantive news organizations. 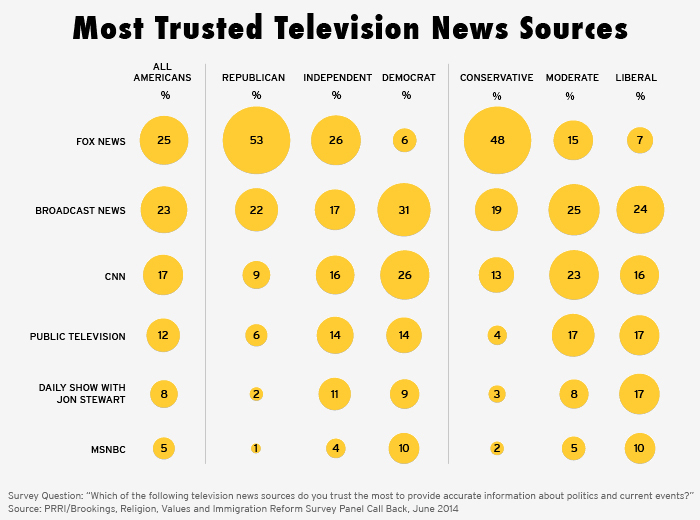 Television remains the primary source of news for most Americans, but local stations have dramatically reduced their reporting staffs, and the networks no longer try to cover the world and the country as they once did. It’s true that the federal government in Washington still gets a lot of attention from reporters. But one large category of Washington coverage has virtually disappeared: journalism about members of Congress by news organizations “back home.” A generation ago scores of local newspapers and television stations employed Washington correspondents who kept an eye on the members of the House and Senate from their cities and states. 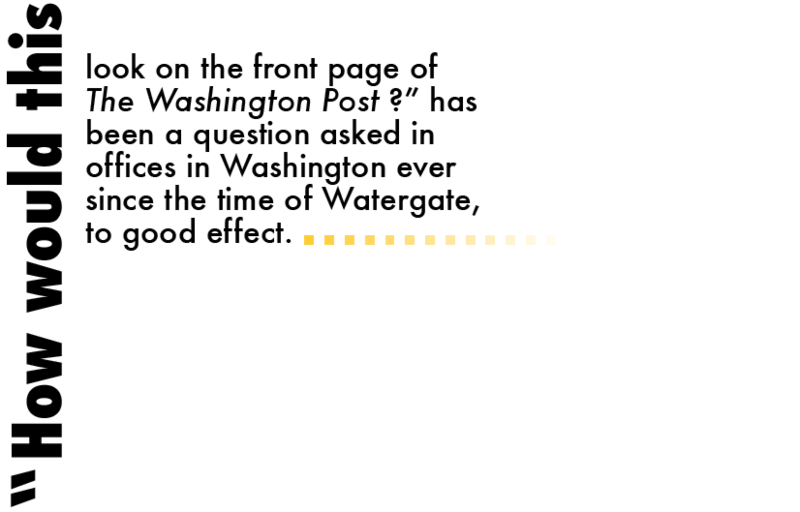 Senator Christopher Dodd recalls that in his early years in the Senate, in the 1980s, a dozen reporters from Connecticut outlets were based in Washington and reported regularly on his activities. By the time he retired in 2010, that number had fallen to zero. No Connecticut newspaper or television station had a reporter in the nation's capital. 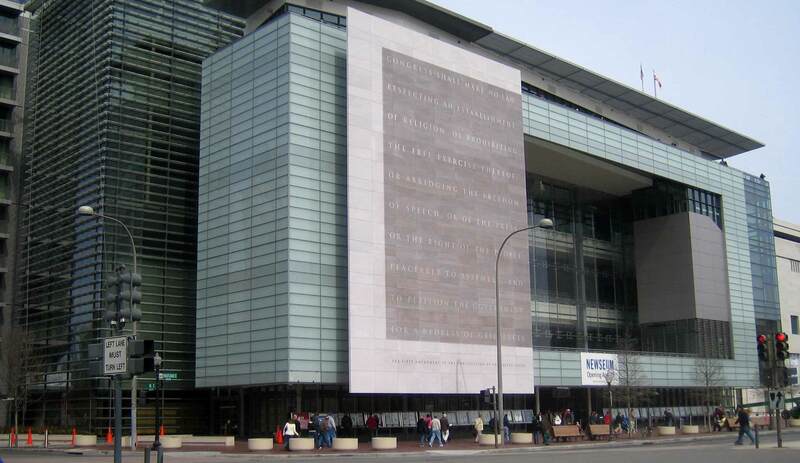 Facade of The Newseum, incorporating the text of the First Amendment to the United States Constitution. Are there no grounds for optimism, or even hope? Of course there are. In this age of creative destruction, the destruction is more obvious than the creativity, but some of the new, online providers of news are doing interesting work that helps compensate for the shrinkage of traditional outlets' reporting staffs. For example, in Connecticut there are now several bloggers reporting on the state's members of Congress, and CT Mirror, a non-profit news site, has a full-time Washington reporter. Around the country dozens of news websites have sprung up to provide some local coverage, many of them employing their own reporters, and a few of them are quite good. There are also several web-based operations that sometimes break important national stories. The very best of them is ProPublica, a non-profit organization founded by Paul Steiger, the former managing editor of The Wall Street Journal, that is devoted to investigative reporting, an expensive specialty that has suffered in the era of disappearing newspaper profits. ProPublica provides pro bono journalism of the highest quality, as good as the investigative projects of the major newspapers. Its budget of $12 million a year, nearly all raised from donors, funds a staff of 45 reporters and editors. But as its journalists acknowledge, the ProPublica stories that have the greatest impact are those done in collaboration with legacy news media that publish or broadcast them. Its own excellent website has a relatively small audience. 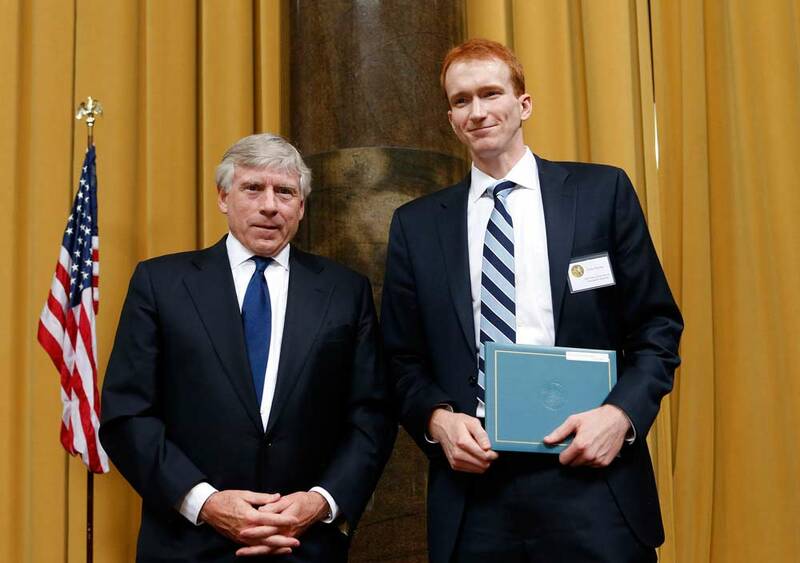 Chris Hamby, right, of the Center for Public Integrity, winner of the 2014 Pulitzer Prize for Investigative Reporting, poses for a photo with Columbia University President Lee Bollinger during the awards ceremony at Columbia University's Low Library, May 28, 2014, in New York. Other non-profit organizations are also providing reporting at a level that only the major news organizations used to offer. The winner of the 2014 Pulitzer Prize for investigative reporting was Chris Hamby of the Center for Public Integrity in Washington, a non-profit watchdog organization that maintains vast electronic files tracing the flow of money into our politics. Marcus Brauchli, who has served as the senior editor of both The Wall Street Journal and The Washington Post, observed recently that thanks to Internet offerings, the quantity of American journalism has never been greater. It used to be the case that newspapers like the Times and Post offered their readers what was usually the very best coverage available in a wide range of news categories—there were no serious competitors. Today there are competitors in every one: ESPN in sports, Politico in Washington coverage, BuzzFeed in the world of popular culture, and so on. We at the Post used to have a corner on the market in Washington—no competitor could challenge us in any of our major categories. No corners are available now. If there is some good news, it's hardly enough to be reassuring. Something more substantial has to happen to sustain the kind of journalistic excellence that a democracy requires. Of course there can be technological surprises. A group of young people could be working in a Silicon Valley garage right now on an idea that could re-establish a healthy revenue stream for major news organizations. I certainly hope so. Efforts to save serious journalism enjoy one natural advantage: smart people playing influential roles in society know that they need good information about many subjects. It is conceivable that these citizens, who are a significant audience albeit a small fraction of the total population, will be willing to pay the full cost of the journalism they consume. At first blush this may sound painfully obvious. Don't people usually pay for the services they use? Not the news. Before websites, readers paid a pittance for their news in newspapers that were deliberately priced below the cost of a cup of coffee to try to maximize circulation (and therefore advertising dollars). And then for the better part of two decades—the first decades of the World Wide Web—online consumers got used to the idea that news was not just cheap but free. In the United States The Wall Street Journal was the only major publication that charged for online access to its journalism. Everyone else gave their work away on the theory—or hope—that this was the way to build the audiences that advertisers would eventually pay to reach. Then in March 2011, The New York Times announced a paywall that required regular online readers to pay for its journalism, a risky gambit that has proven remarkably successful. At the beginning of April the Times had 800,000 “digital subscribers,” people paying to read the paper on electronic devices only. (The daily ink-on-paper Times is bought by 680,000 people, and 1.2 million on Sundays.) Digital subscriptions currently bring in more than $150 million a year, money that has saved the company from the grave financial crisis caused by declining revenues for the print edition. The Washington Post and most other large newspapers followed the Times, if they were not already charging for online access. Though none of the others has had as much success signing up digital subscribers as the Times, the newspaper’s ability to persuade online readers to pay is heartening. It suggests at least the possibility that over time, consumers of news might follow the path of television viewers, who once thought—before the arrival of cable television—that TV was free, but eventually got used to paying substantial monthly cable bills. Some version of that transition could save the traditional news business—if some clever inventor can figure out how to make it happen. Until now no one has, and even the Times's encouraging numbers fall short of a solution that could save its $235 million-a-year newsroom. A morning edition of the Washington Post- August 6, 2013. Amazon.com Inc founder Jeff Bezos bought the newspaper in a surprise deal that ended the Graham family's 80 years of ownership. Last fall, when he met the staff of The Washington Post soon after buying the paper, Jeff Bezos of Amazon spoke about the importance of “the bundle,” as he called the variety of news, opinion, useful information, and entertainment that the Post offers each day. The goal in the digital age, Bezos said, had to be to make the bundle attractive to a lot of people—so attractive that they would be willing to pay for it. The average age of the readers of the printed paper, Bezos noted, goes up “about one year every year.” It's no secret where that leads, he quipped. Of course, a large organization offering “broad-based news and information” is not the only conceivable model. 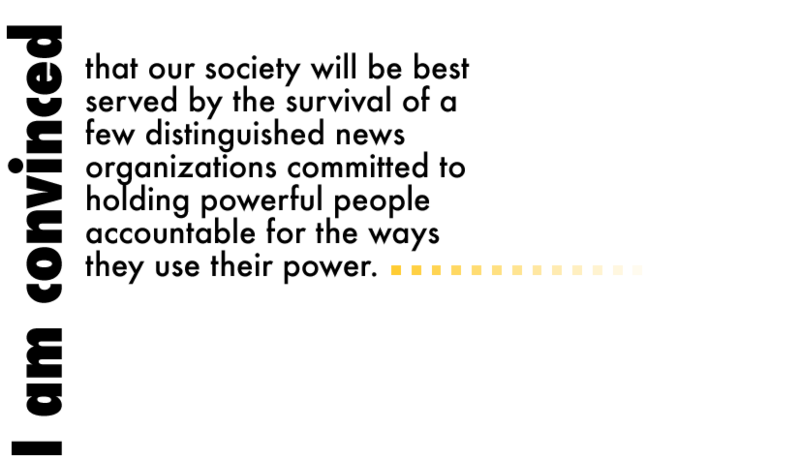 Personally I am convinced that our society will be best served by the survival of a few distinguished news organizations committed to holding powerful people accountable for the ways they use their power. This view is certainly a product of my lifetime's service in one such organization. But there are other possibilities. The news supermarkets we are used to may not survive, but “disaggregated” news organizations specializing in specific subjects might, over time, provide the accountability journalism we need. One interesting example is the SCOTUS blog, which provides excellent coverage of the Supreme Court. It makes no profit, but is supported by Bloomberg. Politico's coverage of Washington and politics, though uneven, is better than that of any but the very best news organizations. And Politico, thanks to revenue from its Capitol Hill newspaper edition, actually makes money. It is also possible that “prosperity” won't be necessary. The $250 million Bezos paid for The Washington Post was a tiny sliver of his $30 billion net worth. For him to cover the Post's losses now costs the equivalent of lunch money for an ordinary mortal—something Bezos could easily afford for decades to come, if he chooses to play the angel's role indefinitely. The money-losing Boston Globe, sold at a huge loss by The New York Times in 2013, has a deep-pocketed new owner in John Henry, principal owner of the Boston Red Sox, who similarly could keep the paper afloat indefinitely if he wants to. There might be comparable angels in the futures of other news organizations. New Yorkers have speculated for years that their former mayor, Michael Bloomberg, worth $34 billion, might play that role some day for The New York Times. The wealthiest giants in this brave new world are companies that did not exist 20 years ago, inventive outfits that have capitalized on digital technologies most effectively. Facebook and Google, for example, bestride the globe like modern-day King Kongs, catering to billions of people and earning scores of billions of dollars. Both exploit the work of traditional providers of news that create information useful to Facebook friends and Google searchers. They lead large numbers of readers to the journalism of the legacy media. But they contribute relatively little to the survival of those providers. Robert G. Kaiser spent more than half a century as a reporter and editor at The Washington Post before retiring early this year. He covered local politics, served as a correspondent in London, Moscow and Saigon, covered Congress and national politics, and spent sixteen years as a senior editor, seven of them (1991-98) as managing editor. He is the author or co-author of eight books, including The News About The News, American Journalism in Peril, written with Leonard Downie Jr. These firms were created by a new generation of young people whose self-interest may lead them either to realize the importance of the legacy institutions, or figure out how to create new ways to do what the old news organizations did in the past. Financially, it would be easy for Google to rescue The New York Times. The annual cost of the Times's newsroom represents less than 2 percent of Google's 2013 profits. Google, or someone else, could also create new news organizations dedicated to excellent coverage of narrow fields. The future, in Mort Sahl's wise words, lies ahead—but remains invisible. News as we know it is at risk. So is democratic governance, which depends on an effective watchdog news media. Both have been undermined by changes in society wrought by digital technologies—among the most powerful forces ever unleashed by mankind. We have barely begun the Digital Age, and there is no point in trying to predict just where it will take us. 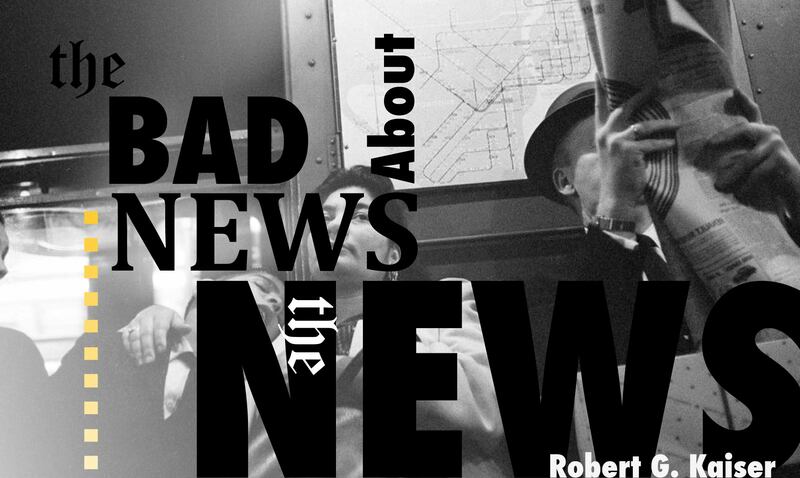 News certainly has a future, but what that will be is unclear. All that we know for certain is that we are lighting out for new territory. Join the conversation on Twitter using #BrookingsEssay or share this on Facebook . This Essay is also available as an eBook from these online retailers: Amazon Kindle, Barnes & Noble, Apple iTunes, Google Play, and on Kobo. Like other products of the Institution, The Brookings Essay is intended to contribute to discussion and stimulate debate on important issues. The views are solely those of the author.